To prepare your pet for the season of heat, make sure to visit the vet pre-summer. Regular vet visits and timely care ensure that heartworm, ticks, and fleas will not be painful and annoying accompaniments to heat. A well-timed trip to the groomer prepares your pet with just the right haircut – a cut that is not too long and not too short yields maximum comfort. Sticking to a healthy year-round diet is another positive for your pet heading into a summer of fun. However tempting, don't share human party food or deviate too much from the diet that is known to keep your pet healthy and content. All year long, keep your pet away from raisins, grapes, onions, chocolate, and products with the sweetener xylitol. When storm windows disappear and screens are in place, make sure that no screen creates the risk of a pet falling out, especially from a high point. Keep pesticides out of reach, and guard against your pet's exposure to chemical treatment of lawns – your lawn as well as neighborhood lawns that you pass on walks. For every day of summer, there are key markers to check. Monitor inside and outside (including pavement!) temperatures, and the water levels in your pet's bowl. Know the signs of overheating, and plan for time in the shade when you attempt reasonable exercise with your pet. Keep water play safe and supervised. If your dog swims or accompanies you on a boat, flotation devices can be helpful. NEVER leave a pet alone in the car, even for a little while, even with windows open, even if it seems to be a "cooler" summer day. As the ASPCA article points out, "leaving pets unattended in cars in extreme weather is illegal in several states." In this story from Dog Heirs website, a British police officer "rescued" what turned out to be a realistic-looking stuffed dog from the backseat of a Mercedes. Passersby concern for the animal on a warm day prompted the intervention. Everyone involved wanted to do the right thing. At the end of a fun summer day, take stock of the day, adding up the fun experiences that resulted from preparedness and remaining attentive to your pet's needs. A cool rinse is a nice way to end the day, particularly if your pet has been in water (salt or chlorine) or has been unusually hot and sweaty. Take a deep breath and dream about the next lazy day of summer! You know your pet best, so take the time to evaluate and implement the summer safety suggestions that are most appropriate. Just like other family members you love and who may be at risk from summer heat—children, the elderly, and those with health issues—your pets need care in order to savor summertime with you. By being organized and prepared, you can make the most of the weeks ahead. 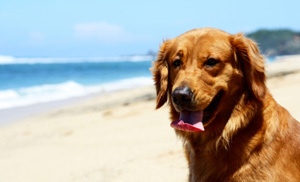 Enjoy a healthy, happy summer season with your pets!